Jermaine Jenas says Nottingham Forest were the only Championship club he considered joining on loan. The midfielder, who made his second Reds debut in Wednesday's 0-0 draw with Blackburn Rovers, has rejoined Forest on a 30-day deal from Tottenham. 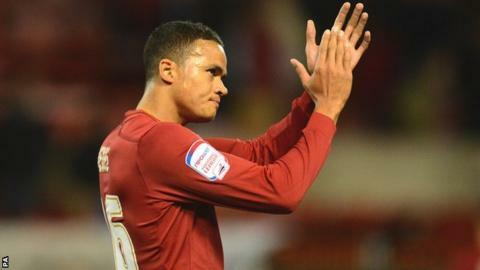 Jenas, 29, told BBC Radio Nottingham: "There was only one club I was going to if I was going to the Championship. "They are packed with good midfielders, but I still wanted to come home and play for the club that made me." England international Jenas, who left the City Ground to join Newcastle United in 2002, has been plagued by injuries in recent seasons and is desperate to get back to playing regular football. Before his 18-minute appearance against Blackburn, he had only played 13 minutes of first-team football this season. "I want to say thanks to the fans for the reception they gave me after coming back following such a long time away," Jenas said. "I have come here to play football. I had my bad Achilles injury and I want to get back playing again. It was nice to get out there and get a feel of the ball. "I need games and we'll see what happens in the next few weeks but I am ready to go and eager to help out. "I wanted this. I nearly did move to another Premier League club in January. It didn't quite happen and the phone was ringing from a number of Championship clubs. "The club are going in the right direction. I started at the club when I was seven or something like that and came all the way through. It's good to be back and see some old faces and I am looking forward to oplaying some football now. "I'm obviously not at the peak of my powers but I know I can add a lot to the team and know I will only get stronger and stronger with games." His departure from Forest 10 years ago came at a time when the club were desperately in need of money, but he says it was not something he was planning. "It was difficult for me," said Jenas who has won 21 caps for his country. "I had only been playing for half a season in terms of first-team football. "I had just brought my flat and was happy but the club had a few issues financially and I was one of their biggest assets at the time, so they had to get the deal done. It probably did come a few months too early for me."